Make the most of your Town or City break with one of our 3D Map & Guides. Choose the sites and attractions you want to see, where you want to stay and the local restaurants, coffee shops or nightlife on offer. 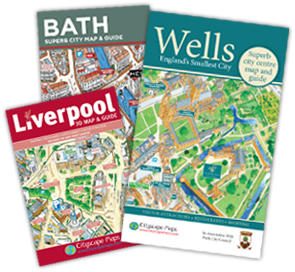 Cityscape Maps is the UK’s only 3D mapping company able to offer your organisation city and town maps, visitor guides, wayfinding signage, leaflet dispensers, heritage trails and information boards. We offer services from consultancy through to publication and installation. With over 20 years of experience, we apply our expertise to all forms of 3D mapping, design and interpretation – including specialist print and signage manufacture.